Issue 1 of SRSP-325.25 has been developed to reflect Industry Canada’s spectrum utilization policy described in SP 25.25 GHz, Spectrum Utilization Policy, Decisions on the Band 25.25-28.35 GHz . This SRSP replaces SRSP-325.35, Issue 1. 1.1	This Standard Radio System Plan (SRSP) states the minimum technical requirements for the efficient use of the frequency bands 25.25-26.5 GHz and 27.5-28.35 GHz by line-of-sight radio systems in the fixed service, including point-to-point and point-to-multipoint systems. 1.2	This SRSP is intended to be employed in the design and specification of radio systems and equipment. 1.3	This SRSP specifies equipment characteristics related to efficient spectrum usage only, and is not to be regarded as a comprehensive specification for equipment design and/or selection. 2.1	This standard replaces SRSP-325.35, Issue 1. Further revision of this SRSP will be made as required. 2.2	The technical requirements for interim licences outlined in Annex B of DGTP-002-10, Consultation on the Use of the Band 25.25-28.35 GHz , are replaced by this standard. The interim licensing process described in Section 9 of DGTP-002-10 will continue to apply until such time as a formal licensing process is established. Systems licensed under the interim licensing process must be coordinated under the procedures applicable to radiocommunication station licences,Footnote 1 as described in RSP-113, Application Procedures for Planned Radio Stations Above 960 MHz in the Fixed Service . The coordination requirements in sections 7.1 and 8 of this standard will apply once the formal licensing process is established. Upon the establishment of this formal licensing process, this standard will be editorially revised to reflect these changes in coordination requirements. 2.3	Radio systems conforming to these technical requirements will be given priority in licensing over non-standard radio systems operating in this band. 2.4	The arrangements for non‑standard systems are outlined in SP GEN, General Information Related to Spectrum Utilization and Radio Systems Policies . 2.6	Even though a radio system complies with the requirements of this SRSP, modifications may be required to the system whenever harmful interferenceFootnote 3 is caused. 2.7	When potential conflict between radio systems cannot be resolved by the parties concerned, Industry Canada should be advised. After consultation with these parties, the Department will determine the necessary modifications and schedule of modifications to resolve the conflict. These modifications may include, but are not limited to, changes to the operating frequency channel, the transmitter and/or receiver antenna deployment characteristics (i.e. gain, backlobe and sidelobe discrimination, polarization, elevation angle, etc.) and the use of a receiver with improved selectivity characteristics. 2.8	It should be noted that the fixed service shares this band with other services in accordance with the Canadian Table of Frequency Allocations 9 kHz to 275 GHz . Notably, the band 27.5-29.1 GHz also has a primary allocation for the fixed-satellite service (FSS) (Earth-to-space). When planning their deployments and conducting interference analyses, fixed service licensees in the band 27.5-28.35 GHz should take into account FSS Earth stations that transmit in this band. 2.9	Upon request, licensees are required to make available to Industry Canada information on certain technical parameters of their point-to-point and point-to-multipoint stations. 3.1	The current issues of the following documents are applicable, and are available on Industry Canada’s Spectrum Management and Telecommunications website at http://www.ic.gc.ca/spectrum. 4.1.1	The band 25.25-26.5 GHz is divided into 19 paired frequency channels, as shown in Table 1 and Figure 1. 4.1.2	The frequency channels are symmetrically paired to facilitate frequency division duplex (FDD) systems. 4.1.3	Time division duplex (TDD) systems may operate in frequency channels B1/B1' to B12/B12'. 4.1.4	Licensees may deploy point-to-point systems in frequency channels A1/A1' to A7/A7'. 4.1.5	Licensees may deploy point-to-point and/or point-to-multipoint systems in frequency channels B1/B1' to B12/B12'. 4.1.6	Assignments for the frequency range 25.501-26.257 GHz (channels B1/B1' to B12/B12') will first be accommodated in channels B1/B1' for point-to-multipoint systems (both TDD and FDD), whereas the assignments for point-to-point systems (both TDD and FDD) will first be accommodated in channels B12/B12'. If these channels are not available, the assignment will be accommodated in the nearest available adjacent frequency channels. 4.1.7	Upon reasonable justification, Industry Canada may consider, on a case-by-case basis, requests to combine two adjacent frequency channels to form a single larger frequency channel. In such cases, the combined frequency channel must meet all the requirements of this SRSP. This figure illustrates the band plan and associated usage for the band 25.25 to 26.5 GHz. The channel centre frequencies are also described in Table 1 of Section 4.1. The frequency ranges 25.277 to 25.473 GHz and 26.285 to 26.481 GHz provide for seven pairs of 28 MHz channels (A1/A1′ to A7/A7′) for point-to-point systems employing FDD. The frequency ranges 25.501 to 25.837 GHz and 25.921 to 26.257 GHz provide for 12 pairs of 28 MHz channels (B1/B1′ to B12/B12′) for both point-to-point and point-to-multipoint systems employing either FDD or TDD. 4.2.1	The band 27.5-28.35 GHz is divided into paired frequency channels, as shown in Figure 2 and tables 2 to 6. 4.2.2	The frequency channels are symmetrically paired to facilitate frequency division duplex (FDD) systems. 4.2.3	Licensees may deploy point-to-point systems in the frequency channels C1/C1' to C7/C7', D1/D1' to D9/D9', E1/E1' to E12/E12', F1/F1' to F18/F18', and G1/G1' to G36/G36'. 4.2.4	Upon reasonable justification, Industry Canada may consider, on a case-by-case basis, requests to combine two adjacent frequency channels to form a single larger frequency channel. In such cases, the combined frequency channel must meet all the requirements of this SRSP. This figure illustrates the band plan and associated usage for the band 27.5 to 28.35 GHz. The channel centre frequencies are also described in tables 2 to 6 of Section 4.2. The frequency ranges 27.520 to 27.880 GHz and 27.970 to 28.330 GHz provide for seven pairs of 50 MHz channels (C1/C1′ to C7/C7′), nine pairs of 40 MHz (D1/D1′ to D9/D9′), 12 pairs of 30 MHz (E1/E1′ to E12/E12′), 18 pairs of 20 MHz (F1/F1′ to F18/F18′), and 3 pairs of 10 MHz (G1/G1′ to G36/G36′), for point-to-point systems employing FDD. 5.1	Licensees are expected to take full advantage of interference mitigation techniques, such as antenna discrimination, polarization, frequency offset, shielding, site selection and/or power control, to facilitate the coordination of systems. 6.1	Usage of the band 27.5-28.35 GHz near the Canada‑United States border is subject to the provisions of the Interim Arrangement Concerning the Sharing between Canada and the United States of America on Local Multipoint Communication Systems, the Local Multipoint Distribution Service and Certain Other Services in Parts of the Frequency Bands 27.35-28.35 GHz, 29.1-29.25 GHz, and 31.0-31.3 GHz . 6.2	Canada does not currently have a formal arrangement with the U.S. government for the sharing of the frequency band 25.25-26.5 GHz along the border regions. Licensees will be subject to any future agreements between Canada and the United States regarding use of these systems in the border regions, which may include modifications of previously authorized stations. As outlined in Section 2.2, the coordination requirements in sections 7.1 and 8 of this standard shall not apply to systems licensed under the interim licensing process described in Section 9 of DGTP-002-10, until such time as the licensing process for these bands is established. The following coordination procedures are intended to be used between two licensees in the absence of another mutually agreed upon standard to govern coordination of any proposed transmitter. Licensees who propose transmitters that would normally trigger the present procedure, but who can mutually agree to an alternate coordination procedure with the licensee of an existing or previously notified system, are not bound by this process. A copy of such a mutual agreement must be kept by the licensee and be made available to the Department upon request. When a licensee proposes to install facilities, successful completion of applicable coordination is required prior to activation. Coordination is required whenever a proposed transmitting station coordination footprint encompasses existing or previously notified receiving stations of another licensee. This figure shows the co-channel frequency coordination footprint for point-to-point systems. Coordination is required with all stations within a distance of 78 km where the off-axis angle at the new station’s boresite is less than or equal to 5 degrees. Coordination is required to a distance of 71 km where the off-axis angle is greater than 5 degrees and less than or equal to 20 degrees. Coordination is required to a distance of 65 km where the off-axis angle is greater than 20 degrees and less than or equal to 80 degrees. At off-axis angles greater than 80 degrees, coordination is required within a distance of 18 km. If a proposed station triggers the coordination process, the licensee is obligated to notify all licensees concerned. The said notice shall include the applicant’s interference analysis and all data required for the recipients to perform an interference analysis (see Annex A for suggested parameters). It is recommended that field tests be performed prior to commencement of operation of a radio system to determine whether interference caused by building reflections or other frequency sources, which was not anticipated during the interference calculations,Footnote 8 is detected at the proposed site while looking along the proposed azimuth. Upon receipt of a coordination notice, a recipient shall have a maximum of 30 calendar days to submit an interference objection. This objection shall include the calculation details of all potential cases of unacceptable interference into and from facilities proposed in the notice. Failure of a recipient to respond to a coordination notice within the 30-calendar-day time frame will indicate that the recipient has no interference objections to the facilities proposed in the notice. Upon successful resolution of all interference objections, the licensee shall so inform Industry Canada and have 180 calendar days to construct and commence operation. Given the possibility of potential interference between adjacent channel systems operating in the same vicinity, all licensees are expected to conduct adjacent channel interference analyses and coordinate accordingly. Where the interference analysis reveals a potential conflict beyond the first adjacent channel, licensees of these systems are also expected to coordinate. It should be noted that the band 25.25-26.5 GHz is adjacent to the band 25.05-25.25 GHz, in which fixed point-to-point and point-to-multipoint systems also operate. Despite the presence of a guardband in the range 25.250-25.277 GHz, there is a possibility of interference between systems operating in the lower portion of the band 25.25-26.5 GHz and systems in the same vicinity operating in the upper blocks of the band 25.05-25.25 GHz. As a result, the adjacent channel coordination requirements described above shall also include systems operating in the band 25.05-25.25 GHz,Footnote 9 for licensees operating in channels A1 to A7. 8.1	Domestic coordination is required between licensed service areas where the shortest distance between the respective service area boundaries is less than 73 km.Footnote 11 Operators are encouraged to arrive at mutually acceptable sharing agreements that would allow for the provision of service of each licensee within their service area to the maximum extent possible. 8.2.1	Operators are required to calculate the power flux density (pfd) at the service area boundary of the neighbouring service areas for the transmitting facilities. Pfd is calculated using accepted engineering practices, taking into account factors such as propagation loss, atmospheric loss, antenna directivity toward the service boundary and curvature of the Earth. The pfd level at the service area boundary shall be the maximum value for elevation points up to 500 m above local terrain elevation (see Annex B for a sample calculation of a pfd level). 8.2.2	Deployment of facilities that generate a pfd less than or equal to −125 dBW/m2 in any 1 MHz band at the other service area boundaries is not subject to any coordination requirements. 8.2.3.1	The operator must notify the respective licensee(s) of its intention to deploy the facilities, and submit the information necessary to conduct an interference analysis. 8.2.3.2	The recipient of the notification must respond within 30 calendar days to indicate any objection to the deployment. Objection may be based on harmful interference to existing systemsFootnote 12 only. 8.2.3.3	If there is no objection raised, the deployment may proceed. 8.2.3.4	If an objection is raised, the respective licensees must work in collaboration to develop a suitable agreement before the deployment of facilities. The time frame to develop such an agreement should not exceed 30 calendar days. 8.2.3.5	Proposed facilities must be deployed within 180 calendar days of the conclusion of coordination; otherwise, coordination must be reinitiated as per Section 8.2. 8.2.4	The above process is described graphically in Annex C of this document. 8.3	All results of analysis on pfd and agreements made between licensees must be retained by the licensees and made available to Industry Canada upon request. 8.4	Given the possibility of interference between adjacent channel systems operating in the same vicinity, all licensees are expected to conduct adjacent channel interference analyses and coordinate accordingly. Where the interference analysis reveals a potential conflict beyond the first adjacent channel, licensees of these systems are also expected to coordinate. The centre frequency of the emission shall be maintained within ±0.001% of the assigned frequency. 9.3.1	The maximum equivalent isotropically radiated power (e.i.r.p.) of a transmit station must not exceed +55 dBW per carrier. 9.3.2	For point-to-point systems, the e.i.r.p. density must not exceed +30 dBW/MHz. 9.3.3	For point-to-multipoint systems, the e.i.r.p. density must not exceed +30 dBW/MHz for subscriber stations and +14 dBW/MHz for hubs. For hubs in point-to-multipoint systems operating in the band 25.25-26.5 GHz and having a main beam with an elevation angle Θ greater than 5° above the horizontal plane, the e.i.r.p. density limit must be lowered to +14 − 10log10(Θ/5) dBW/MHz. 9.3.4	For systems operating in the band 25.25-26.5 GHz and having the main beam of the transmitter within a 1.5° angle (taking into account the effect of atmospheric refraction) of the direction of any geostationary‑satellite orbit (GSO) location,Footnote 13 the e.i.r.p. density limit must be lowered to +24 dBW/MHz for point-to-point systems and subscriber stations in point-to-multipoint systems, and +8 dBW/MHz for hubs in point-to-multipoint systems. Additionally, for hubs having an elevation angle Θ greater than 20°, the e.i.r.p. density limit must be lowered to +14 − 10log10(Θ/5) dBW/MHz. (a)	In any 1 MHz band, where the centre frequency is removed from the assigned channel centre frequency by more than 50% up to and including 250% of the authorized bandwidth, the mean power of emission shall be attenuated below the mean output power of the transmitter in accordance with the following equation. In no case shall the attenuation be less than 11 dB. Attenuation greater than 56 dB or to an absolute power of less than −13 dBm/MHz is not necessary. (b)	In any 1 MHz band, where the centre frequency is removed from the assigned channel centre frequency by more than 250% of the authorized bandwidth the mean power of emission shall be attenuated by 43 + 10 log10 (mean output power in watts) dB or 80 dB, whichever is the lesser attenuation. For a multi-carrier transmitter or multi-transmitters sharing a common final stage amplifier, the emission mask is to be the same as for single-carrier transmitters, but using the occupied bandwidth that is defined for multi-carrier transmitters. The total mean power shall be the sum of the individual carrier/transmitter powers. When several transmitters share a passive antenna, each transmitter should satisfy the individual mask for single carrier transmitters; the multi-carrier mask should not be applied in this case. The ITU’s requirements, as described in Annex D of this document, are applicable to the band 25.25-26.5 GHz. 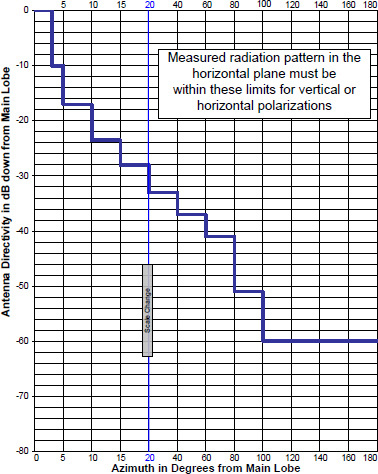 For point-to-point systems, the co-polarized radiation pattern envelope in the horizontal plane of the antenna must remain within the envelope shown in Figure 4 and Table 7, for both vertical and horizontal polarizations. For point-to-multipoint systems, there is no requirement to meet any specified co-polarized radiation pattern envelope. However, subscriber stations in a point-to-multipoint system must use a directional antenna. Line graph: Shows the antenna radiation pattern limits in dB down from the main lobe for azimuth separations from the main lobe between 0 and 180 degrees. The y-axis measures antenna directivity in dB down from main lobe from −80 to 0. The x-axis plots azimuth in degrees from main lobe from 0 to 180. There is only one data line. The line ranges from −60 to 0 on the y-axis. There is a scale change indicator at the 20 mark on the x-axis. Several data points for the line are shown in Table 7. Measured radiation pattern in the horizontal plane must be within these limits for vertical or horizontal polarizations. Note: More parameters can be provided if needed for the coordination process. The following example is provided to illustrate how the power flux density (pfd) level at the service area boundary can be determined: It should be noted that the calculation example assumes line-of-sight conditions due to a short path length and a high transmitting antenna. In other cases, where the path length is long and the transmitting antenna is low, line-of-sight conditions may not exist. In these cases, an appropriate propagation model that takes the non-line-of-sight situation into account should be used. This figure shows the geometry for the sample pfd calculation. A hub transmitter station is located within Service Area X. The goal is to find the pfd resulting from this transmitter at the boundary of a nearby Service Area Y. 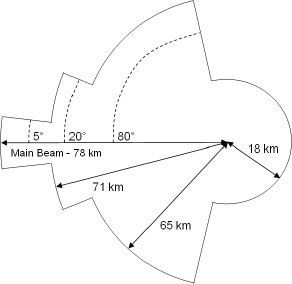 The distance, Dkm, to be used in this calculation is from the hub transmitter location to the boundary of Service Area Y, i.e. not from boundary to boundary. This hub transmitter has an associated power, PT, and gain in the direction of the boundary of Service Area Y, GT. 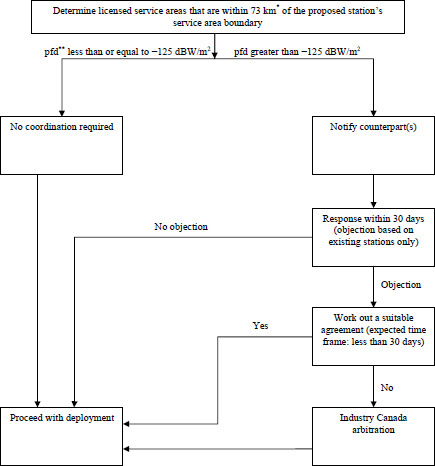 This figure provides a flow chart to illustrate the domestic inter-system coordination process for point-to multipoint systems where a sharing agreement between licensees has not been concluded. This process is fully described in Section 8. *	In the event that an operator uses sites of very high elevations relative to local terrain that could produce interference to service areas beyond 73 km, the operator shall coordinate with the affected licensee(s). **	Pfd is calculated at the service area boundary of the respective counterpart(s). Sites and frequencies for terrestrial stations and earth stations, operating in frequency bands shared with equal rights between terrestrial radiocommunication and space radiocommunication services, shall be selected having regard to the relevant ITU-R Recommendations with respect to geographical separation between earth stations and terrestrial stations. (1) The maximum equivalent isotropically radiated power (e.i.r.p.) of a station in the fixed or mobile service shall not exceed +55 dBW. (1) The power flux-density at the Earth’s surface produced by emissions from a space station, including emissions from a reflecting satellite, for all conditions and for all methods of modulation, shall not exceed the limit given in Table 21-4. The limit relates to the power flux density which would be obtained under assumed free-space propagation conditions and applies to emissions by a space station of the service indicated where the frequency bands are shared with equal rights with the fixed or mobile service, unless otherwise stated. 1 21.2.1 For their own protection receiving stations in the fixed or mobile service operating in bands shared with space radiocommunication services (space-to-Earth) should also avoid directing their antennas towards the geostationarysatellite orbit if their sensitivity is sufficiently high that interference from space station transmissions may be significant. 2 21.2.2 Information on this subject is given in the most recent version of Recommendation ITU-R SF.765 (see Resolution 27 (Rev. WRC-03)*). * Note by the secretariat: This Resolution was revised by WRC-07. −105 dB(W/m2) in any 1 MHz band for angles of arrival between 25 and 90 degrees above the horizontal plane. Information on licensed radiocommunication stations can be retrieved from Industry Canada’s Spectrum Direct website. SP 1-20 GHz, Revisions to Microwave Spectrum Utilization Policies in the Range 1-20 GHz , January 1995, contains new spectrum utilization principles, including the Geographical Differences Policy guideline. This information will be incorporated into a revision of SP-GEN.
For the purposes of this SRSP, "harmful interference" means interference that endangers the functioning of a radionavigation service or of other safety services or seriously degrades, obstructs, or repeatedly interrupts a radiocommunication service operating in accordance with regulations and technical requirements laid down by Industry Canada under the Radiocommunication Act . The requirements of this section apply to the coordination of a new point-to-point station with other existing stations, which could be either point-to-point or point-to-multipoint. A link from a subscriber station to a hub station in a point-to-multipoint system is not subject to the coordination requirements of this section, but is subject to the requirements for point-to-multipoint systems in Section 8. For this coordination procedure, radio system "B" requires coordination with radio system "A" if there is any significant overlap of the interior spectrum skirts (i.e. both co-channel and adjacent channel regardless of their occupied bandwidth). In the event that an operator uses sites of very high elevations relative to local terrain that could produce interference to receiving stations beyond the distances shown in Figure 3, the operator shall coordinate with the affected licensee(s). The distances shown in Figure 3 are based on an elevation of 50 metres relative to an even terrain profile. Calculations to determine the distances for which interference is produced should use accepted engineering practices, taking into account factors such as propagation loss, atmospheric loss, antenna directivity and curvature of the Earth. Calculations can be made with the help of Bulletin TSB10-F, Interference Criteria for Microwave Systems , available from the Telecommunications Industry Association (TIA), or other recognized coordination methodology and criteria. Technical requirements for fixed systems operating in the band 25.05-25.25 GHz are shown in SRSP-324.25, and information on licensees operating in that band can be retrieved from Industry Canada’s Spectrum Direct website. The requirements of this section apply to the coordination of a new point-to-multipoint station with other existing stations, which could be either point-to-point or point-to-multipoint. In the event that an operator uses sites of very high elevations relative to local terrain that could produce interference to service areas beyond 73 km, the operator shall coordinate with the affected licensees. The distance of 73 km is based on an elevation of 50 metres relative to an even terrain profile. Calculations to determine the distances for which interference is produced should use accepted engineering practices, taking into account factors such as propagation loss, atmospheric loss, antenna directivity and curvature of the Earth. Existing systems include systems that are operational prior to the receipt of notification or systems that have previously been successfully coordinated. The ITU-R identifies GSO data relay satellite orbital positions in the most current version of ITU-R Recommendation SA.1276, which can be accessed at the following ITU-R web page: http://www.itu.int/rec/R-REC-SA.1276/en. Version 3 of the recommendation identifies the following orbital positions (given in the East direction): 10.6°, 16.4°, 16.8°, 21.5°, 47°, 59°, 77°, 80°, 85°, 89°, 90.75°, 95°, 113°, 121°, 133°, 160°, 171°, 176.8°, 177.5°, 186°, 189°, 190°, 200°, 221°, 298°, 311°, 314°, 316°, 319°, 328°, 344°, and 348°.